Is this not the cutest thing you've ever seen? 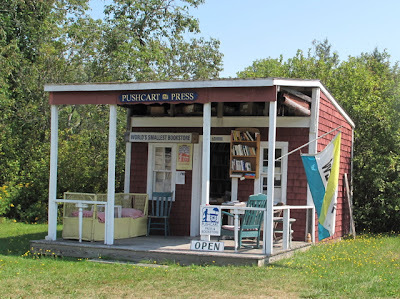 Pushcart Press is the tiniest bookstore and located in Maine. I'm adding this to my list of places I need to visit next time I'm up there. I can't help but wonder if they operate on an honor system or if somebody really mans the store. This is very sweet. Surely it is on the honor system. How cute is that??? I always say the coziest things are the small ones loaded with charm as this appears to have plenty of! P.S. Yes, it is on the honor system.